Virat Anushka are now hitched and making to headlines with their small acts. They are inviting people for their reception. It is shared from the Twitter handle of PM Modi that PM got an invitation from Indian cricket captain Virat Kohli and his Bollywood star wife Anushka Sharma for their wedding reception in Delhi today. The newlywed couple met PM Narendra Modi and invited him for their wedding reception. As their wedding was a close affair so the couple has thrown two receptions for their family and friends. In the list of guests, our PM is VVIP. 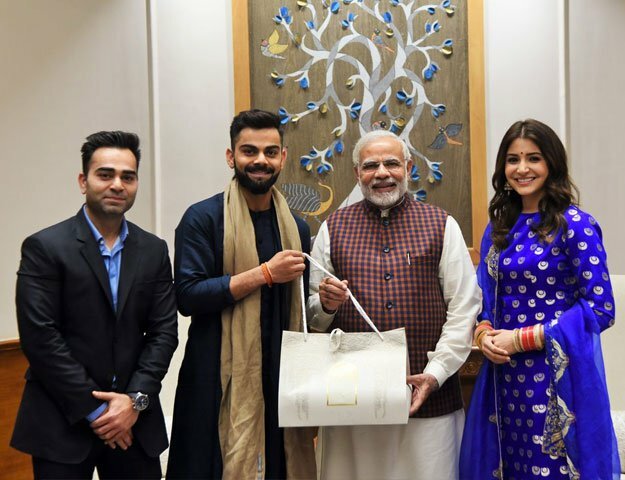 A picture is shared in which Virat Kohli and Anushka Sharma handing over the invitation hamper to PM Modi. Prime Minister Narendra Modi congratulated them on their wedding. It is unclear if PM Modi will actually attend says reports. The newlywed couple looks amazing in ethnic wear. Anushka has worn royal blue suit while hubby Virat has matched the wifey’s blue with his blue kurta and dupatta. In fact, a video of three has also been shared. Check out the video.